SUPPORT THEIR CANDIDATURE BY SHARING YOUR STORIES ABOUT WHY THEY DESERVE TO WIN. 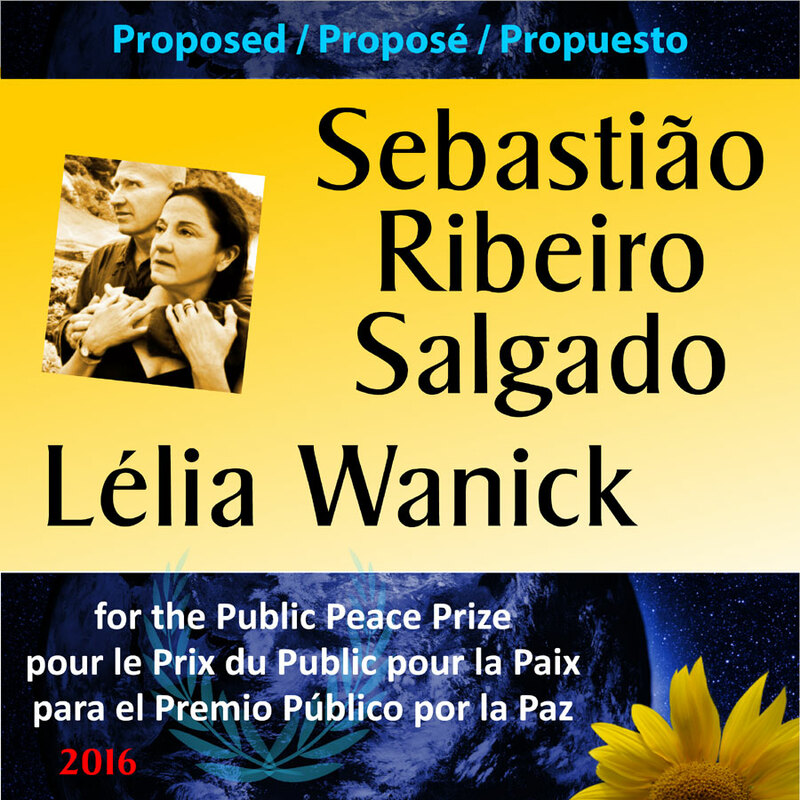 ONCE WE HAVE RECEIVED TEN SUPPORTING COMMENTS, Sebastião Ribeiro SALGADO and Lélia WANICK WILL BE OFFICIALLY NOMINATED FOR THE PUBLIC PEACE PRIZE. The nomination will then be posted on the PPP website. After that, every supporting comment added to Facebook or on the website will count for 3 votes in their favour. Sebastião Ribeiro Salgado and Lélia Wanick married since the early 1970s, produced The Salt of the Earth, a prize-winning film at the 2014 Cannes Festival. Their eldest son Juliano says that his parents share an incredible bond and a single vision of the world. We could say that, their art is a way for them of exploring new, more harmonious and equitable relationships between human beings and nature. Sebastião Salgado is a Brazilian photojournalist and “citizen of the world.” A brilliant student, he earned a master’s degree in Economics at the University of Sao Paolo. In 1969, he began to study for a doctorate in agricultural economy at École Nationale de la Statistique et de l’Administration Économique (ENSAE) in Paris. In 1971, he was hired to work for the International Coffee Organization (ICO) in London, where he stayed until 1973, when he made a drastic career change and became interested in photography. Successively, he worked with the photo agencies Sygma (1974-1975), Gamma (1975-1979) and Magnum (1979-1994). In 1994, in Paris, he formed his own photo press agency, Amazonas Images, with his wife, Lélia Wanick Salgado. Humanist, economist and Marxist, Sebastião Salgado began his career in photojournalism with projects about humanity’s great ills, Workers in 1993 and Migrations in 2000. Very much aware of ecological issues, in 2013, he returned from an eight-year trip around the world with a series on fauna and flora entitled Genesis. His new black and white portfolio has the effect of an atomic bomb. Biblical in their aesthetics, his large breathtaking prints respect the laws of visual arts in every way. Indeed they could almost be confused with sculptures (Eddystone Rock. Falkland Islands, 2009), paintings (Grey-headed Albatross. Chile, 2005) and even engravings (Bighorn Creek, Canada, 2011). In addition to being supremely artistic, Genesis teaches us about unknown lands on which only Salgado has walked. Through one of his photographs of a piercing white sled being pulled by reindeer (Russia, 2011), we learn that on the Yamal Peninsula in Siberia, the largest sleds are driven by women. Also Brazilian-born, Lélia Wanick moved to Paris early in her life. In addition to her secondary education, she spent several years studying piano at the Conservatory, French at the Alliance Française and attended an artist’s studio to study painting. Married to Sebastião Salgado, they lived in Paris with theirs sons Juliano, – who followed in his father’s footsteps to become a filmmaker – and Rodrigo who has Down syndrome. In Paris, Lélia studied architecture at Ecole Nationale Supérieure des Beaux Arts, and urban planning at Université de Paris VIII, where she obtained her bachelor’s and master’s degrees. She worked in the field of land-use planning in various towns in France. Her interest in photography began in the early 70s and grew with the years. In 1983 she changed her field, working first with the Photo Revue, and then, in 1984, with Longue Vue, both photography magazines. Salgado picks his projects from every corner of Brazil. His work is always in black and white. He observes the life of those who live and work in difficult conditions: migrants, miners, victims of famine… One of his most renowned reportages entitled The Mines of Serra Pelada, shows the everyday life in a gold mine in Brazil. This coverage describes the working conditions to which the workers are subjected. In 2001, he was appointed a UNICEF Special Representative. In 2013, Sebastião and Lélia published together a collection of works entitled Genesis, a portfolio of large-sized prints from various locations on the planet. Later, a mainstream edition presented a different collection of photographs organized into five geographical chapters: Sanctuaries, Planet South, Africa, Amazonia and Pantanal, and Northern Spaces. In their own way, the collection of works and the mainstream edition — both created and produced by Lélia Wanick Salgado — paid tribute to Sebastião Salgado’s Genesis project, a project as grandiose as it was outstanding. The couple also established Instituto Terra, a private organization which has enabled the reforestation of the Rio Doce Valley in Brazil. This couple, photographers enamoured of the environment, fill our minds, fill our hearts. This makes them peacemakers. Throughout their lives, Sebastiâo and Lélia have faced together the challenges of life and have had the courage to take great risks, ultimately worthwhile risks. They are among those people who are not satisfied with following the norm or falling into line. By inventing their life, they invent a new reality for humanity.